Photos from the 30-Year Party! We are expecting many more photos to begin rolling-in but for now we have our first gallery of pics ready for visitors. Click this to see our gallery of 90 photos from the 30-Year Reunion party on October 15, 2011. Big thanks to Jonathan Wallace, Jay Warren and MaryBeth Compton (and anyone else!) for running around and snapping these pics for us! 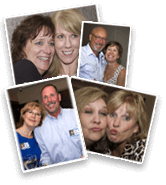 Posted in 30 Year Reunion, News, Photos | Comments Off on Photos from the 30-Year Party!